Learn how booking direct will save money & get the room you want. Infographic provided by Acorn Internet Services. Booking a hotel room or inn stay used to be so easy. You’d pick up the phone and call your favorite member of Distinctive Inns of New England (DINE). Today, with online booking it’s a little harder to know who you’re talking to when you make that reservation. The innkeepers at Distinctive Inns of New England have an important message for you, and it’s just two simple words: Book Direct! Next time you plan to enjoy that romantic getaway at one of their New England inns, be sure to contact the DINE member directly either by phone or via their own website. 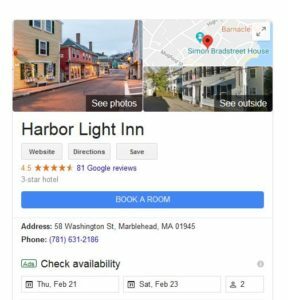 Did you know when you search for the name of a lodging property on Google and see that blue “Book A Room” box, you’re not connecting directly with the inn you searched for? Instead, you’re being directed to an Online Travel Agency (OTA) who will make a reservation for you. These are called third party bookings. If you didn’t know that, don’t worry. You’re in good company. Recently, Acorn Internet Services, Inc. in conjunction with the Professional Association of Innkeepers International and Association of Independent Hospitality Professionals (all important businesses and associations in the B&B industry) conducted a survey of 1,000 U.S. Google users, both men and women, from the ages of 18 to 65+. They were all asked if they thought clicking the BLUE “Book a Room” button would allow them to book direct at the property’s website. 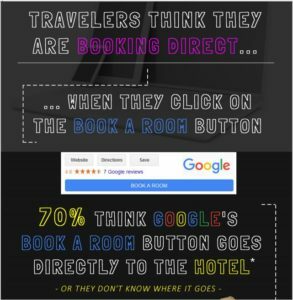 Believe it or not, 70-percent of those surveyed responded that they thought that Google’s “Book A Room” button went directly to the hotel or inn. There are three important reasons to book directly with the Distinctive Inns of New England member inn of your choice. 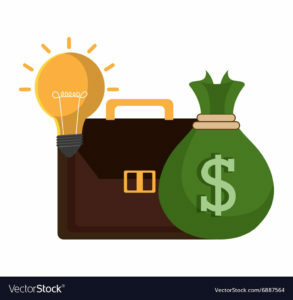 OTAs “own” the reservation: When you book on a third party site, like Booking.com, Expedia or Hotwire, that Online Travel Agency (OTA) “owns” your reservation. That means if anything changes and you need to change the dates of your stay or other aspects of the reservation, the innkeeper can’t help you. You will be required to live by the OTA’s cancellation policy and work with the OTA to change it. DINE innkeepers wish they could help you with the change, but their hands are tied. They must abide by the OTA’s rules of reservations. Trust us, the OTAs are much less understanding or able to make exceptions that DINE innkeepers are when it comes to changes. No upgrades: Once your reservation is made with a third party, it’s set. That means your DINE innkeeper is unable to upgrade you to a different room level. The innkeepers are bound to provide a room at the level you booked, with no changes. While as often as possible, they’d love to upgrade you to the next level of room, they are bound to provide only the room you have booked. Savings: Did you know that when you book a reservation on an OTA, it costs the innkeeper a commission? When you book direct with your favorite DINE property, your reservation does not cost the innkeeper a fee. This often means that the innkeeper can offer additional savings when you book directly with the inn. At a minimum, when you book direct, the innkeepe r can apply savings via AAA or AARP discounts, when requested. More room options: As you might expect, innkeepers don’t offer up all of their room inventory to the OTAs. They offer a select few. Thus what you might find on Travelocity or Hotwire is not the entire availability for rooms. Celebrating a special occasion and want the best room at the inn? Chances are you won’t find it on an OTA. Book directly with the inn and you can choose from all the available rooms. If you’ve visited a DINE inn, you know how much you love it, and the innkeepers who own it. Do your DINE innkeepers a favor. Next time you want to plan a DINE getaway, be sure to go directly to the website of the inn or call them and book directly with them. Mention you read about it in this DINE blog posting and you can be sure that your innkeeper will appreciate your willingness to work directly with them. And we have one more favor to ask. Please tell all your traveling buddies to book direct too! Use the hashtag #BookDirect, and we’ll be most grateful. We’ll help you out! Click below on your favorite DINE inn and we’ll deliver you directly to their website to book direct! Maine: Captain Jefferds Inn in Kennebunkport & Camden Maine Stay Inn in Camden. This entry was posted in advice, Distinctive Inns of New England, New England Getaways, New England Weekend Packages and tagged book a New England inn, Book direct, book direct at DINE inns, book direct at Distinctive Inns of New England, booking a reservation at a New England B&B, direct booking, making reservations at New England inns, New England inn getaways, New England inn reservations by DINE Blogger. Bookmark the permalink.